MP's joined WWF's "Charging up for earth hour" event in the Victoria Tower Gardens next to the Palace of Westminster. 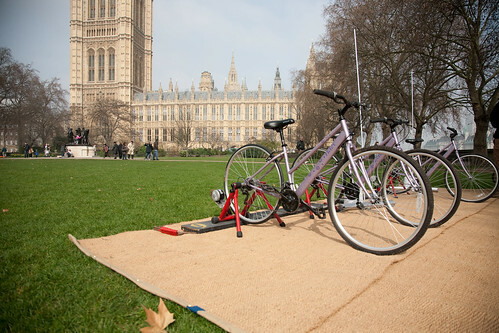 MPs from across the UK showed their support for WWF Earth Hour by powering our bicycle generator to charge up batteries which will be used to project natural world images onto the Royal Albert Hall during Earth Hour. Together the 37 MPs managed to generate about 200watt-hours of energy which will enough to power the Earth Hour projection for about 60 seconds. Not a bad effort at all! Have a read what MP Simon Wright had to say about the event.